Actual Cake Board Dimensions ~ 10 inch diameter, ~ 3/16 inch thick. These ten inch cake rounds are now available. You asked for an attractive and affordable cake board and here it is! Take a look at the photo above and note the razor cut edges of the cake round. 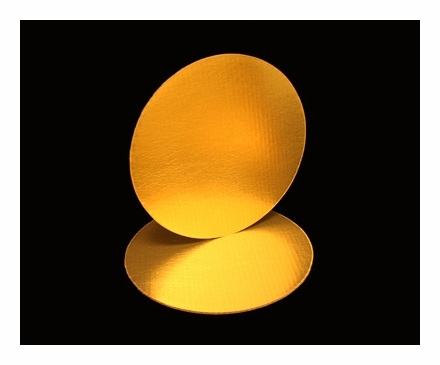 These grease resistant gold foil laminated cake boards are die cut. 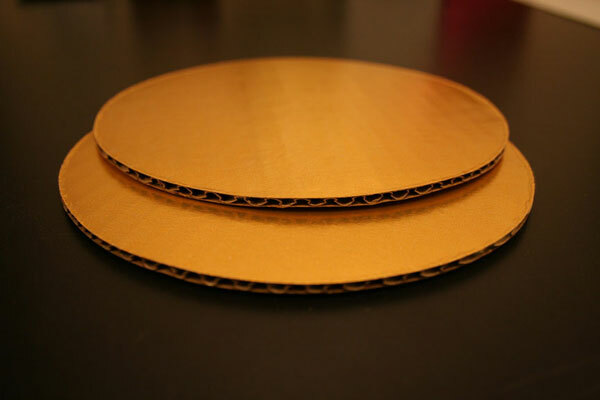 This manufacturing method leaves the crisp edge of the corrugated cardboard exposed. You can actually see the cardboard flutes giving these little medallions their strength. If you are looking for something simple, affordable, strong, and still classy - our ten inch cake rounds may be just the platform to present your sweets. Ordered these foil lined rounds for my King Cakes. For years I've covered my own. So nice to pull out rounds that are ready to go! Plus they look beautiful and are sturdy to boot! I just received my second order from BRP Box Shop. 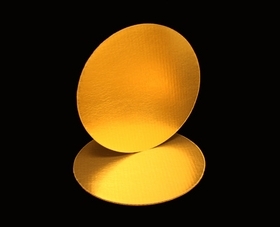 Prices on the cardboard rounds are very reasonable, and shipping was fast. What else is there to say? I will definitely order again. I really needed some new gold cake boards since I spend my days cutting round ones out of any large thick card boards I find in the house. These are just what I was looking and asking for. The gold foil and the material of the board is just perfect!